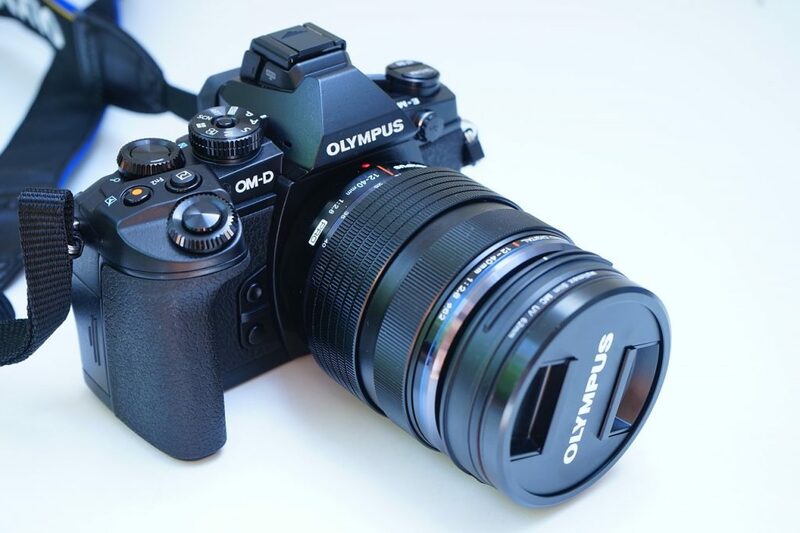 I am often asked what kind of camera I use to take bird pictures and I have found a mirrorless camera is the best solution for me. 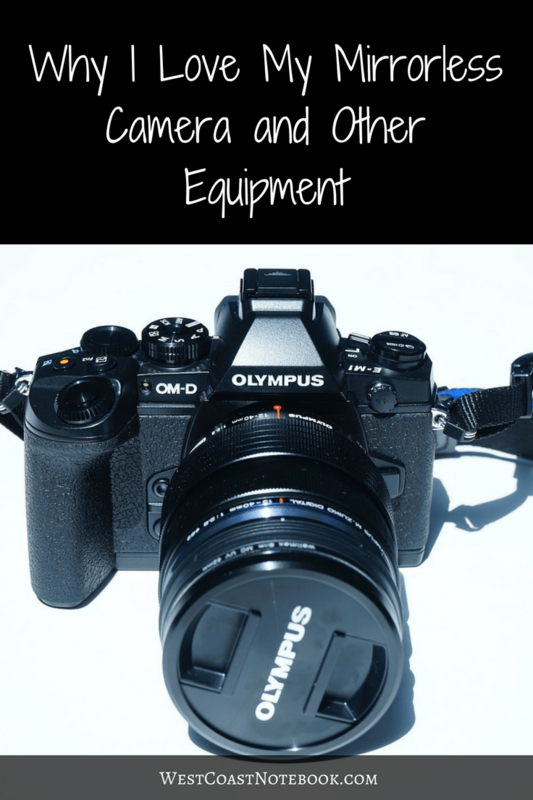 So here is my camera and a current list of the equipment I use in the field. I will supply a link after each item if you wish to look at it or read the reviews on Amazon. I’m not writing a review of my camera, but rather giving you an idea of why of love it so much and how it works for me taking pictures. 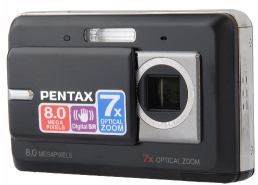 This is a point and shoot camera that I have from a few years ago. They don’t seem to make it anymore, but it’s what I take pictures with when out in the garden and around the yard. I don’t care if it gets a little dirt on it and it fits easily in my pocket. If you look at the picture below and the size of the lenses you will get a sense of why I love my mirrorless camera so much. The lenses pictured here are a Panasonic 100-300mm f4/5.6 vs Canon 600mm f4. 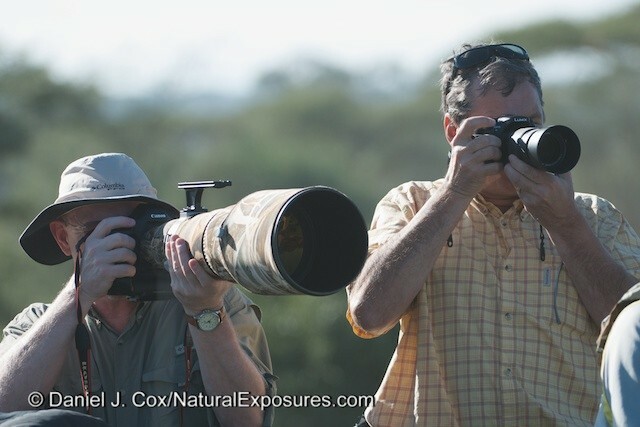 They both have the same reach as the mirrorless doubles the mm (so 300mm is 600mm) but I don’t need a sherpa to pack around my equipment with the Olympus M1 and the Panasonci 100-300mm lens. A comparison shot that shows the size difference between a normal sized Canon 600mm F/4 telephoto and the similarly powerful Panasonic GH3 with a 100-300mm lens that converts to a 200-600mm F/4-5.6 equivalent zoom. Just in case you can’t see the GH3, it’s on the right and the Canon is on the left. There are always rainy days when one needs a waterproof cover for their camera. There are lots of fancy and expensive equipment options to cover your camera, but I found the best solution for me is just a dry bag. I have two. 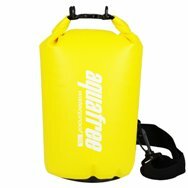 One that I use when we are travelling or in the boat, and the other when I am walking or hiking. I use the one in the boat in case the camera get sprayed or falls overboard. I haven’t tested it, but the bag is watertight and is suppose to float. Here is hoping I never have to test it. Click here to view. The other dry bag has a bit of a modification. I took a pair of scissors and cut an X in the bottom of the bag, just big enough for my camera lens and hood to fit through. It’s a tight fit, so it seals around the hood and leaves the lens free. Easy to carry and I can just pull back where you clip it together to see the controls and viewfinder on the camera. I have a couple of blinds that I use as well as just camouflage netting to put over myself in the field. I am always amazed at how the birds just ignore them and allow me to take pictures. They really do work. This is a great option for the backyard. I will set it up on my deck so I am level with the bird feeders and can just pop in and out of it when I see something interesting. It also keeps out the bugs. Click here to view. This one is a little different and I haven’t used it a lot yet, but it’s actually for changing clothes in. I got it because it was smaller and a little lighter than the hunting blind and easier to pack when hiking. I throw a camouflage net over the top and pop inside and sit down leaving the opening slightly open for my camera. I might just make a slit in the side for the camera lens, but as I said, I haven’t used it a lot yet so I’m not sure exactly what will be easiest. Click here to view. I do very little editing on my photo’s and try and get it right in the field. The most I do is to crop and possibly sharpen an image. There are all sorts of cool things you can do with photo editors, but I like to see the photo as I shot it and don’t always have time to play around with it to get the “perfect” shot. What you see is what you get! The first program I use is called BreezeBrowser Pro. I open the pictures that I’ve taken for the day in the program and it’s easy and quick to sort through them keeping the ones in focus and deleting the rest. When I take over 1000 pictures a day, this is a real time saver. I have found the following courses and books very helpful. I took Glenn’s Vancouver Island workshop in the spring of 2013. After years of taking pictures on my own, Glenn really helped me in taking my camera off auto focus and showed me I could even take pictures in the rain. He’s very knowledgeable and a great teacher. Click here to view his workshops and work. As you can see from my list, I like everything to be easy and lightweight. It suits how I take photo’s as well as the terrain where I bird. I very rarely pack a tripod with me and normally take the monopod but most of my pictures are handheld. When I travel I pack my mirrorless camera, extra batteries, charger and monopod along with my laptop in a backpack with extra clothes and jacket to protect them. Easy to carry on a plane and take your gear out when going through security.